Dragonfly Semicircle Personalized Address Plaque - - unique design with semicircular-bordered personalization set within a 16.75" x 7.75" rectangular dragonfly theme sign. Made in USA. Holds one or two lines of personalized text. The one-line version holds up to five 3" numbers. Or BS black plaque with silver characters; GS dark green plaque with silver characters; RS red plaque with silver characters; DS dark blue plaque with silver characters; WG white plaque with gold characters; WH white plaque with black characters; BW black plaque with white characters; AC antique copper; OG bronze with gold characters; TI taupe with ivory characters; PS pewter with silver characters; OB oil-rubbed bronze. Note: for colors AB antique brass, AC antique copper, and OB oil-rubbed bronze, plaque and characters are the same color, so there is little contrast. 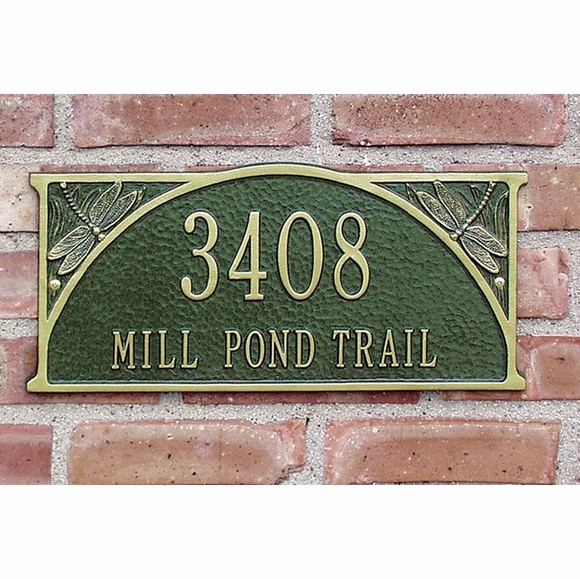 Dragonfly theme personalized address sign for wall mount or lawn placement.